The results are in! 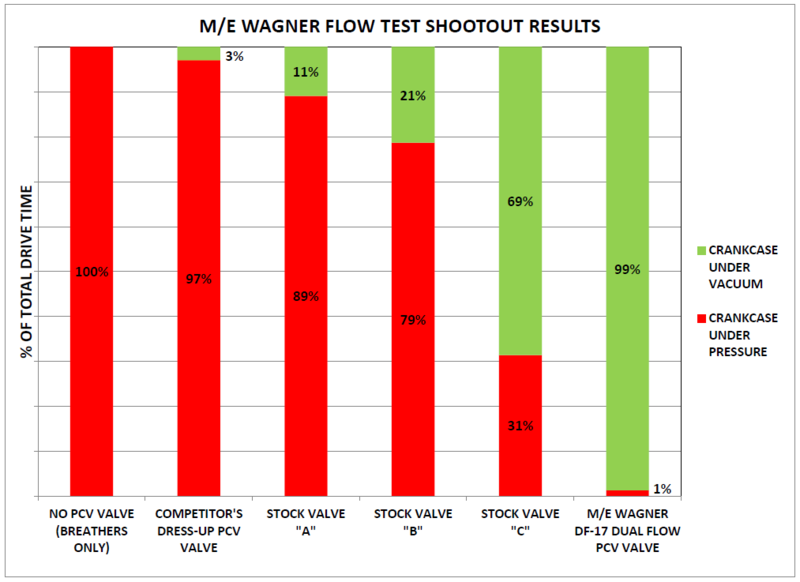 M/E Wagner recently developed a data acquisition system that logs realtime crankcase pressure measurements, enabling us to do a side by side comparison of several PCV valves. The data confirms what we already knew – not all PCV valves are created equal. All data was logged with a laptop during actual on-highway driving. Driving conditions were varied from light, moderate to heavy throttle identically for each test. The test route was a 17 mile round trip consisting of uphill, downhill and flat sections of road. 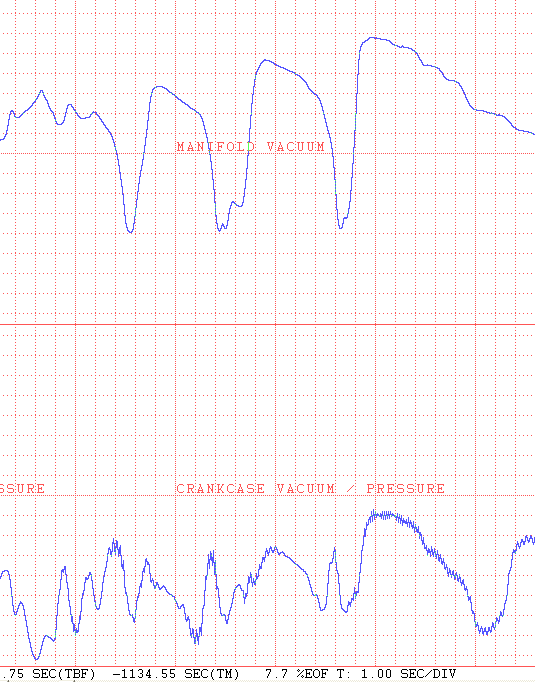 The same test was performed twice for each valve, and the results averaged. Each valve showed excellent consistency from Test 1 to Test 2, validating the accuracy of the testing method. Full testing details can be seen below. The most basic metric of evaluating a PCV valve’s performance is how effectively it evacuates the crankcase of blowby under a variety of driving conditions. When a PCV valve flows the proper amount of air, it will evacuate blowby from the crankcase and draw fresh air into the crankcase through the valve cover breather During this condition, a slight vacuum is present in the crankcase. This slight vacuum is also helpful in preventing oil leaks. When the engine produces more blowby than the PCV valve can handle, the blowby gasses find their way out through the valve cover breather. In this condition, the crankcase is under a slight amount of pressure, and no fresh air is drawn into the crankcase. This pressure is detrimental for oil leaks, but also indicates a more serious problem is present, the crankcase is not being properly evacuated. The acids and moisture present in the blowby are not being cleaned from your crankcase under this condition. We won’t name names with the competitor’s dress-up valve we tested, however we will mention that we have observed this particular valve on a number of cars at car shows. It isn’t a coincidence that many of these vehicles had a pool of oil or a towel around the opposite valve cover breather to mop up the excess blowby being constantly forced out. An interesting note is that all three stock valves tested had exactly the same physical outer dimensions! All valves were listed as compatible with one or more V8 applications from the manufacturer, we did not test with 4 or 6 cylinder only valves to make the results fair. As can be seen from the results, the flow performance can vary greatly depending on which stock valve you happen to pick, as well as which valve happens to be compatible with your engine’s vacuum profile. The chart above shows the average over both tests for the integral (or area) under the pressure vs. time curve. The curve was split into areas that were above zero and below zero and integrated separately, so the pressure integrals did not cancel out the vacuum integrals. 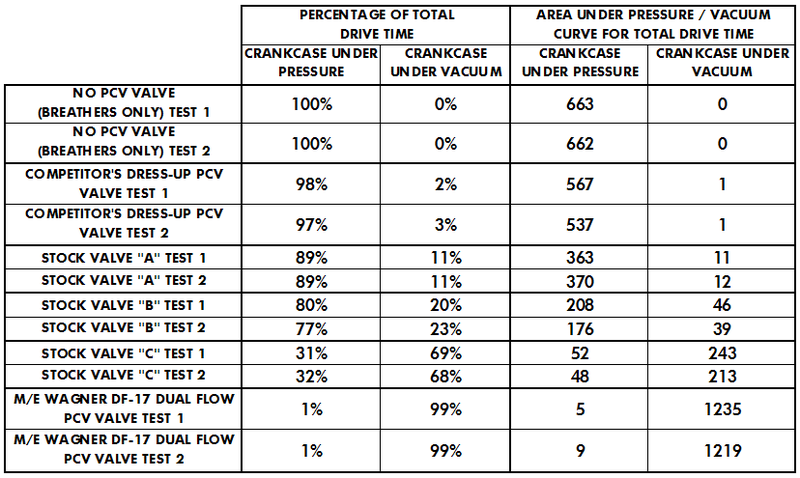 This information can be used to determine to what degree the crankcase was under pressure or vacuum. For example, a valve that kept the crankcase under a low amount of pressure would have a low pressure integral (undesirable). A valve that kept the crankcase under a high amount of pressure would have a high pressure integral (even more undesirable). A valve that only moderately kept the crankcase under vacuum would have a low vacuum integral. A valve that kept the crankcase well under vacuum would have a higher vacuum integral (desirable, indicates proper ventilation). The “under pressure” integral is proportional to how much blowby was forced out of the breather during the drive cycle, while the “under vacuum” integral is proportional to how much fresh air was drawn through the crankcase during the drive cycle. The chart above shows full details of the testing data. This data was used to generate the averages displayed in the color coded graphs above. It can be observed from this data that over multiple tests, the same valve produced very similar results from test to test. This validates the consistency of the testing methods.